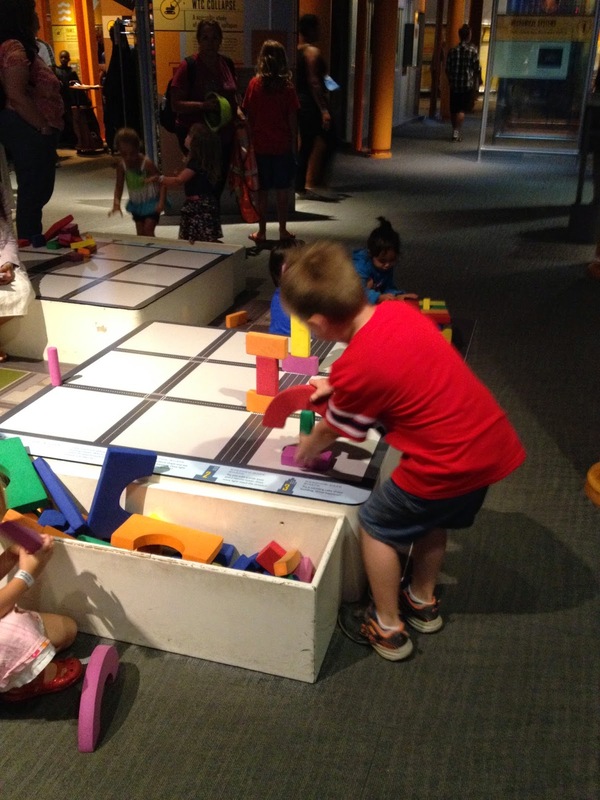 A Review of Liberty Science Center : What Age is Best for My Child to Visit? Every kid should have a chance to visit Liberty Science Center in Jersey City, but sometimes it's hard to figure out what age to bring them. What age is right for a science center, after all? Well, that all depends on your child. But hopefully you can read through my description and some of the reader comments below to help you make your decision. There's a lot of information here, but my post is designed for easy reading, so scroll through to find the headlines you're looking for. Just for the record, I was NOT compensated by Liberty Science Center for this trip, this is not a sponsored post. It's just me, sharing my opinions with you because I'm cool like that. What is the Liberty Science Center? On their Twitter page, LSC (I'm just going to abbreviate from now on- you get it, right?) refers to themselves as a 'wonder factory,' and I swear that's the best way to describe them! They are open year round. And one of the coolest things you see when you arrive is the Hoberman Sphere, which slowly expands and contracts before your eyes. The Jersey Momma's Boy was excited to begin his journey through the LSC! Liberty Science Center is like a giant hands-on learning experience. There are four floors with exhibits that range from animals to communication, infections to energy - you name it, there's learning going on. There are tunnels, rock walls, animals, movies, and just about anything you can think of. You MUST visit their website for a complete list of current exhibits, because they're always changing. We were fortunate enough to be there for their Rubix Cube exhibit, but in the past we've seen Curious George, Avatar, Thomas the Train, New York City exhibits and more. "The Infinity Climber is the world’s first suspended climbing play space of its kind. The structure itself measures 26 feet wide, 24 feet deep, and 19 feet tall. It is surrounded by 19 miles of hand-threaded wire that forms a protective mesh to prevent climbers from falling to the ground below." It's pretty awesome, isn't it? The kids all seemed to love it, and even if you're not climbing inside of it, it's incredible to look at! What Else Will I See at Liberty Science Center? There's literally too much to name. You can check out their entire list of live shows, films, and exhibitions here. Each floor holds different experiences. The Jersey Momma's Boy (and most of the kids there) was fascinated by the giant sneezing nose in the Infection Connection. Energy Quest has some fun ways to create power, like water, solar and wind. You can pedal a bicycle to create power, or race cars with solar energy. 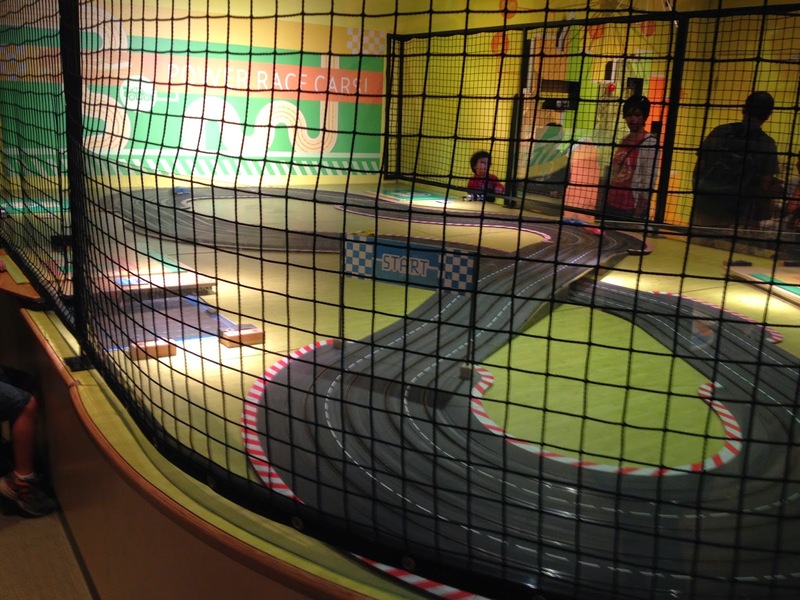 Try your hand at solar power racing! We adore the Eat and Be Eaten exhibit, where you can see a variety of different animals and insects (the tamarin monkeys and naked mole rats were my favorites). And I love the 'Our Hudson Home,' where you can see some of the beauty that the Hudson River offers. The fish of the Hudson were particularly fascinating! Who knew they could get so big?? There's even a touch tank here for the kids, too. I also liked the observation deck, where you could walk outside and see the New York City skyline. Another exhibit that The Jersey Momma's Boy loves is the Wonder Why area. 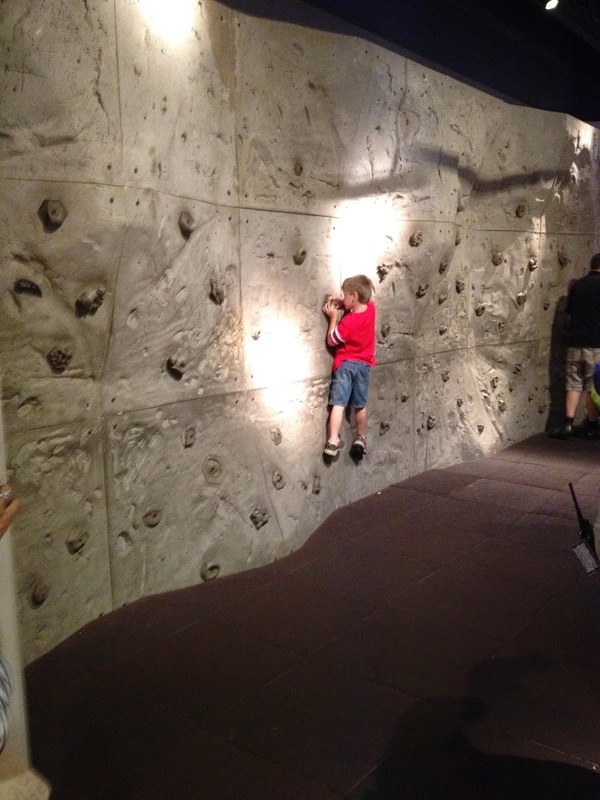 Here he was able to climb a mini rock wall, make giant bubbles, test his arm strength, and more. Skyscraper was a beautiful and touching exhibit, with artifacts from 9/11 on display. Although The Jersey Momma's Boy was too young yet, older children can 'walk the steel' beams high above the displays. They can experience a 'hurricane in a box' (which is actually pretty funny to watch from the outside! ), build with colorful blocks and more. Liberty Science Center also boasts beautiful views of the New York City Skyline and the Statue of Liberty. The photo below is old but I wanted to include it in the post because it shows the construction of the Freedom Tower in the skyline. The Touch Tunnel - is it scary? LSC is home to another cool exhibit called The Touch Tunnel. Designed to show you what it's like to rely on all of your senses (not just your sight!) 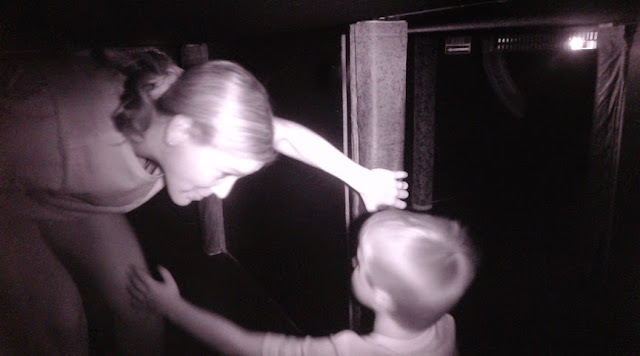 for navigation, the touch tunnel is a dark (and I mean dark) crawlspace type of tunnel. Adults must accompany children under 7 (and this is a low tunnel, so adults must crouch/crawl if they follow their little ones in). If you have a bad back, bad knees or are particularly tall, this is not the exhibit for you. If your child is afraid of the dark, of confined spaces or narrow tunnels, this is not the exhibit for you! I journeyed through with the Jersey Momma's Boy on more than one occasion. The tunnel is pitch black, and you pretty much use your hands to navigate through, touching the carpeted walls for guidance (it only takes a few minutes to navigate through, but seems much longer. Their site says ten minutes, but I would say it took us five. I suppose it depends on how crowded it gets)). One year we cheated a bit because The Jersey Momma's Boy had light up shoes, so they helped guide our way. I also saw someone using the light from their cell phone to help (but that does kind of defeat the purpose!). There are employees monitoring what's going on inside the tunnel at all times, and they can help anyone who might be in distress or get upset during the exploration (I think they have an emergency 'light on' switch if needed). If you make it to the other side you can see a photo of yourself in the tunnel on their computer screens, and even have it emailed to yourself! I'm quite proud of these pictures, believe it or not. So...Is My Child the Right Age for Liberty Science Center? I feel like LSC is right for any age. Honestly, there's really something for everyone. The I Explore area is designed specifically for ages 2-5 and contains mini animal exhibits, hands-on learning and fun climbing opportunities for little learners. Older children can learn a lot from every exhibit. The Energy Quest exhibit specifically has a lot of opportunities for higher level thinking. Some of the exhibits were over my little one's head. By that I mean that he was too little to understand them yet (he was 4 during our first visit and 6 during our second visit). But he still enjoyed experimenting and playing, so I think it kid of balances out. When he gets older and we return again, he'll be better able to read more of the displays and understand the concepts. For added fees you can view LSC's current films and shows. They have an amazing, wrap around screen and tiered seating. Infants under 2 are not permitted in the theater. The theater is situated inside the dome that you see from the outside of the building. It's one of the first things you notice about LSC! If you choose to skip the shows, you might be missing out on some incredible science magic, but there is still so much to see and do in the center, so don't fret. The Planetarium is stunning and truly worth visiting if you are interested in the universe and our beautiful night sky. Attending a show is an added fee, but there are shows for various ages and it's really an incredible experience. You can see a list of their shows here. Where Can I Eat at Liberty Science Center? I actually really like the food at LSC. It's basically a cafeteria but I really like their wood fired pizza. They also have sandwiches and other hot meals available, as well as desserts, drinks and snacks. Plenty of choices for picky eaters! There's a lot to choose from and the eating area can get kind of crowded, so arrive before or after the lunch rush for best seating. Prices were reasonable for a type of place such as this. *You can read more about their food options and allergen information here. This is one of my favorite souvenir shops to visit. But if you've read my entries before, then you know The Jersey Momma's Boy and Mr. Jersey Momma are not big fans of souvenir shops. So I always leave them in the Skyscraper! exhibit when I want to shop here (the shop is across from it). The Jersey Momma's Boy builds his super structures out of blocks with Mr. Jersey Momma and I run off to look at all of the shirts, rocks, science books, jewelry, stuffed animals, astronaut food, exotic candy, LEGO sets, STEM toys, and other fun things that this funky shop has to offer. How Much Does Liberty Science Center Cost? As always, be sure to check the LSC website for the latest ticket prices and cost (as of the publication date of this entry, prices for children 2-12 begin at $18.75 each and adults started at $22.75 each - additional fees are applied for theater shows and combo tickets). I don't know about you, but I find it difficult to locate the exact ticket prices on their website, so if you need a chart of the prices, you'll find it here. We tend to visit places like this during the week in the morning, so crowds are at their lowest. But if you come during a busier time or on the weekends, the line for ticket purchase can be super long. You might want to order tickets online in advance for that reason. You might be able to find coupons online or in the KidStuff coupon books that are sold in some schools. Groupon and Living Social also have deals at times, so always search around on the internet for your best price. Sign up for Liberty Science Centers emails and follow them on social media for up to date coupons and special events. There is ample parking at LSC and an overflow lot if necessary. It states on their website that they charge a $7.00 parking fee, but the last time we went (during the week) there was no parking cost. I'm not sure why that was. Their website also offers extensive directions from all areas. *strollers are permitted and there is a lot of walking, since this is a large place, so be sure to take along what you need for your little ones! *LSC also hosts birthday parties, camps and special events, so keep that in mind if you're looking for a fun place to party! *the bathrooms we visited were clean and family friendly, also plenty of them located on each floor, as well as water fountains. There is even a nursing room available if you inquire at the front desk. *LSC offers Teacher Appreciation Days and Special Needs Days, amongst other things. Check out their website for more info! *also to note here, the fabulous Liberty Humane Society is located right beyond the parking lot of the LSC. Why not bring them a donation (here's a link to their wishlist) or stop in to find a furry friend after visiting the science center? Great article on an awesome place! Awesome review! Helpful bit on the appropriate ages for the museum. My baby is only 8 months old, but we'd still love to take him to LSC soon. Do you think it'd be a wasted visit? Hi there! Thanks for reading and commenting! I wouldn't say your visit would be 'wasted,' because I'm sure you would enjoy visiting and I'm sure your baby would enjoy the stimulation of being there! But most of the activities and attractions are geared towards ages 2 and up (there is a special area for the young ones ages 2 and up, but most of the science center is for kids even older than that). If you can wait till your baby is a year old, that might be a little better. I would personally want to wait until they are old enough to really enjoy it, but you know your child best! Ultimately, the decision is yours! It's not cheap to visit there, so you have to keep that in mind, too! Many of the local zoos are awesome for babies- Turtle Back, Bergen County Zoo (Van Saughn Park), Adventure Aquarium, etc. They are very child (and baby!) friendly! Hope that helps. I am interested in taking my 13 month old. He's very active. He's been walking since 10 1/2 months and loves bright colors, lights, sounds. I haven't been to LSC in so long and I'm not sure if he's too young. Would be be able to play in that area geared for 2 and up? Hi Brittany! He would be able to play in that area but it's a small area for the LSC entry cost, so much like the reader who commented above, you just have to think about spending the entry fee and if it's worth it for you (I think your baby would be free but you'd still have to pay for your own entry). There are animals and other things your baby might enjoy, too, so if you don't mind the entry fee and being the one to guide him through the exhibits, then I say go for it. But if you want him to remember what he sees and you're concerned about the cost, I would suggest waiting until he's a little older. I understand where you're coming from because my son loved visiting these places at a very early age, but I was a total germaphobe and THAT'S what kept me away until he was older. I didn't want him touching all of that stuff at such a young age. But germs don't bother a lot of moms, so go with your gut instinct. I hope that helps! I have family from out of town coming with 3 high school kids. Is there anything for their age at the Liberty Science Center? I think it would still be fun for high school aged kids, especially if they like science! I actually think high school aged kids would get more out of the trip than younger kids. They might especially like the planetarium there. The Intrepid is also fun for older kids and an easy ferry ride across the river if you're willing to give it a shot.